Raccoons are intriguing creatures, with their mischievous masks and agile hands. It's hard to avoid seeing raccoons, as their habitat has expanded over time. If you don't want them poking about your home, secure your trash cans and limit access to any food, including your garden, in your yard. Raccoons are plentiful throughout most of North America, though you won't see them in parts of the Rocky Mountains and some southwestern states. They extend up into Canada, down into Mexico and in the northern region of South America. Successful introductions elsewhere in the world, such as Russia, Japan and Germany, have extended their reach globally. Once upon a time these creatures foraged along tropical riverbanks. They expanded their habitat by moving north and adapting to whatever territory suited them. Clever critters, they learned to take refuge in barns to stay warm in cold northern winters. As their natural habitat shrinks, they've adapted to urban living, and there aren't many places off limits to them. Whether on the farm or in the city, in a marsh or prairie, or in the forest, these adaptable characters will find a place to call home. Home for a raccoon depends on his habitat. Raccoons prefer dark, dry and warm areas that offer protection against predators such as packs of dogs or coyotes. Tree cavities or hollow logs do fine as a resting place, as does a rocky cavern. Of course, urban living often doesn't offer such opportunities, but the easygoing raccoon can make do, taking advantage of drainpipes, crawl spaces, basements and attics. 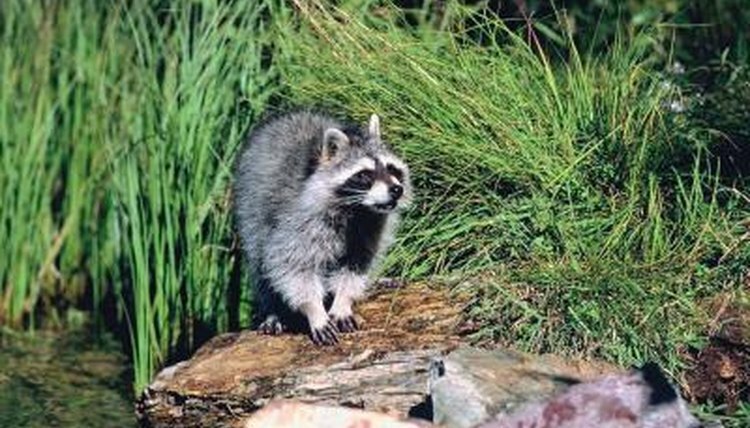 Habitat influences the raccoon's diet. In the wild, these guys dine on worms, frogs, fish, nuts, insects, birds, grubs, eggs, snakes and fruit. If they're farm-dwellers, they'll take advantage of what's available on the farm, eating corn, orchard fruit and poultry. Their distinctive paws and fingers are useful in urban settings, allowing them to remove trash-can lids and forage for food in the garbage. In northern settings, raccoons will often gorge themselves in the spring and summer to store body fat for the winter, where they'll pass much of their time sleeping in their dens. What Kinds of Nuts Do Squirrels Eat? What Do Foxes Prey On?